By the turn of the century, the Old West had instituted official legal entities throughout the states and most of the vigilante groups had disappeared. From there on out, almost all of the lynchings that occurred in the 20th century were either racially or politically motivated. The international response, condemning the U.S. for lynching foreign citizens residing in the U.S. resulted in the State Department having to pay out hundreds of thousands of dollars in damages to foreign governments. Between 1887 and 1903 a total of $480,000 was paid to the governments of China, Italy, Great Britain and Mexico alone. 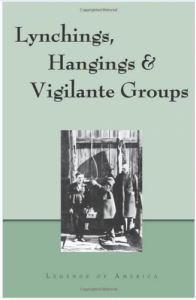 During this time, Americans traveling abroad routinely encountered critical commentaries in foreign newspapers and magazines condemning the common practice of lynching in the United States. How could America, these foreign critics asked, champion human rights abroad when it failed to prevent and punish the most brutal human rights violations at home? Between the years 1880 and 1905, not one person was ever convicted of any crime associated with these killings. Lynchings are, in effect, the most extensive series of unsolved murders in American history. 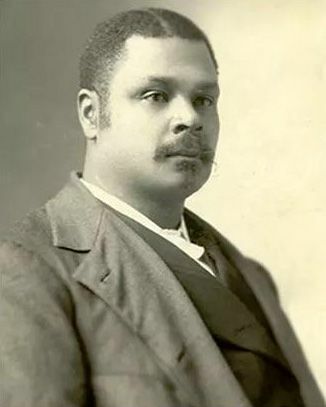 In 1901, George Henry White, the last former slave to serve in Congress, proposed a bill that would make anyone involved in a lynching a federal crime. He pointed out that lynching at the time was primarily being used by white mobs in the south to terrorize African Americans. He supported his proposal by showing statistics that of the 109 people lynched in 1899, 87 were African Americans. However, the bill was defeated. On October 8, 1902, a town mob of 500 in Newbern, Tennessee lynched two black men by the names of Garfield Burley and Curtis Brown. Burley had confessed to killing a well-known young farmer near Dyersburg, Tennessee named D. Fiatt over a horse trade. Later, when Burley demanded that the trade be declared off, Fiatt refused and Burley shot him down when Fiatt was on his way home. When Burley was apprehended by a posse he implicated Curtis Brown as an accomplice. When the mob appeared and demanded possession of the prisoners, Criminal Court Judge Maiden pleaded to the group to allow the law to deal with the case, stating that the two men would be placed on trial the very next day. However, the mob would not listen. The prisoners were taken to a telephone pole, where they were securely tied face to face and strung up. Available at Legends’ General Store! On August 3, 1906, the mob numbered into the thousands when five black men — Nease and John Gillespie, Jack Dillingham, Henry Lee, and George Irwin, were lynched in Salisbury, North Carolina. Accused of murdering members of a local family by the name of Lyerly, the victims were tortured with knives before being hanged and then riddled with bullets. The authorities in North Carolina, alarmed at what was one of the largest multiple lynchings of the 20th century, took unusual steps to punish the leaders of the mob. After the Governor ordered the National Guard to restore order, local officials arrested more than two-dozen suspected leaders. One of the killers, George Hall, was convicted and sentenced to 15 years at hard labor in the state penitentiary. The New York Times predicted that, by taking these measures, North Carolina’s Governor Glenn was not improving his political prospects. On January 9, 1907, an atypical lynching victim was taken from the Floyd County Jail in Charles City, Iowa. James Cullen, a wealthy, white, 62-year-old contractor had murdered his wife and fifteen-year-old stepson, Roy Eastman the day before. The mob was orchestrated by young men, perhaps acquainted with the ill-fated Eastman. When the group of several hundred men, rammed down the doors of the jail with a rail iron, the sheriff and several deputies offered only feeble resistance. Seizing Cullen, they hanged him from the local Main Street Bridge. By 11:30 p.m. a crowd of at least 500 residents, including women and children, had gathered to view the swaying body of James Cullen hanging from the bridge. In 1908 eight black men were lynched on June 24th near Hemphill, Texas. The trouble began when a local man named Dean was shot and six black men were arrested in connection with the crime. Soon, a mob stormed the jail, taking the six men and hanged them all on the same tree. Later the same evening another black man was found shot, and the next morning two more African-American corpses were found hanging from trees near the town. On August 1st of the same year, four men were hanged simultaneously in Logan County, Kentucky. Joseph Riley, and Virgil, Robert, and Thomas Jones were discontented sharecroppers in Russellville, Kentucky, with whom a man named Rufus Browder was a friend and lodge brother. When Browder and James Cuningham, the farmer for whom he worked, had an argument, Browder turned away when Cunningham cursed him and struck him with a whip. Cunningham then drew his pistol and shot Browder in the chest. Browder, in self-defense, returned the fire and killed Cunningham. After having his wounds tended to, Browder was arrested and sent to Louisville for his own protection. 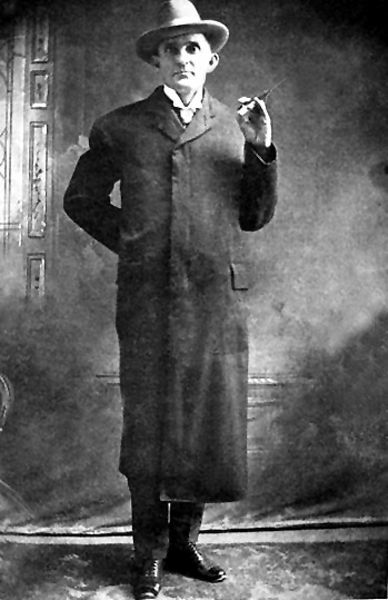 Another vigilante mob killed a notorious killer named Jim Miller, also known as Killin’ Jim. Miller, who was sometimes known as “Deacon Jim” for his Sunday preachings, killed more than 30 men in Texas and Oklahoma as one of the first known “killers for hire.” When the law finally caught up with him, he was sentenced to death, but Miller only laughed. The finest criminal lawyers in the West were on his payroll, and he soon bragged that he would be released after his attorney filed their appeals. However, a crowd of vigilantes did not wait for these legal procedures to take place. They knew that Miller, who had often bragged of his many killings, might cheat justice through his highly paid lawyers. On the night of April 19, 1909, a lynch mob broke into the jail in Ada, Oklahoma and dragged Miller and three others out to a livery stable. Though the other men begged for their lives, Jim “The Killer” Miller showed no signs of fear. He only asked that his diamond ring be given to his wife and that he be permitted to wear his black Stetson while he was being hanged. The vigilantes granted these wishes. Then Miller, standing on a box, displayed his last act of bravado, shouting “let ‘er rip!” He then voluntarily stepped off the box to be jerked by the rope around his neck which was tied to a rafter in the stable. He dangled as the other three were strung up. The bodies were left hanging for some hours in order to allow a local photographer to take enough photos of the lynchings. These photos sold for many years in Ada, Oklahoma to tourists. The only surviving photo shows Miller hanging with the others, his black hat on his tilted head. 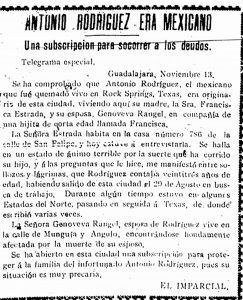 In the American Southwest, people of Mexican descent were also prey to ‘mob’ violence, as evidenced by the lynching of Antonio Rodriquez on November 3, 1910, in Rock Springs, Texas. Allegedly, Rodriquez had killed a white woman by the name of Mrs. Clem Hernderson after the two had had an argument. Rumors circulated that he had committed the murder in front of Mrs. Henderson’s five-year-old daughter. 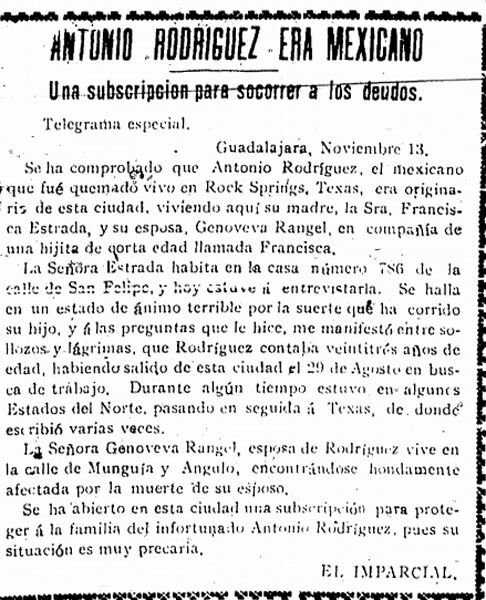 His guilt was based solely upon her husband’s third-hand description of the suspect delivered over the telephone and most likely Rodriquez was the victim of a tragic case of mistaken identity. In any event, the young cowboy was captured, taken a mile outside of town, tied to a mesquite tree, doused in kerosene, and burned alive. In late April 1911, a posse visited the Nelson cabin in Oklahoma, suspecting Mr. Nelson of stealing cattle. While they were looking for meat, Nelson’s 14-year-old son, L.W., shot and killed Deputy George Loney, who was in charge of the posse. Laura Nelson, the boy’s mother, claimed to have shot the Deputy, in an attempt to protect her son. Both mother and son were taken to the Okemah County jail. Days later Mr. Nelson pled guilty to stealing cattle and was sent to prison. While Laura and her son awaited their trials, Laura was determined to be innocent of the crime. However, on May 25th, forty men stormed the sheriff’s office. The jailer, named Payne, lied that the two prisoners had been moved elsewhere, but when a revolver was “pressed into his temple,” he led them to the prisoners. Mother and son were then hauled by wagon six miles west of town to a steel bridge crossing the Canadian River and hanged. The next morning a black boy taking his cow to water, discovered the two bodies swaying under the bridge. Before long the scene had attracted hundreds of viewers before the bodies were cut down. No one was ever arrested for the crime.